Common uses of the Fishbone (Ishikawa) diagrams are product design and quality defect prevention. They are effectively used to identify potential factors causing an overall effect for making possibility to solve a problem. To create Fishbone Diagrams, Cause-and-Effect Diagrams, Ishikawa Diagrams, we recommend to use a ConceptDraw DIAGRAM software enhanced with Fishbone Diagrams solution from the Management area of ConceptDraw Solution Park. Fishbone Diagrams Solution provides the Fishbone Diagrams library with 13 ready-to-use vector objects that can be used to create Fishbone Diagrams in a few minutes. 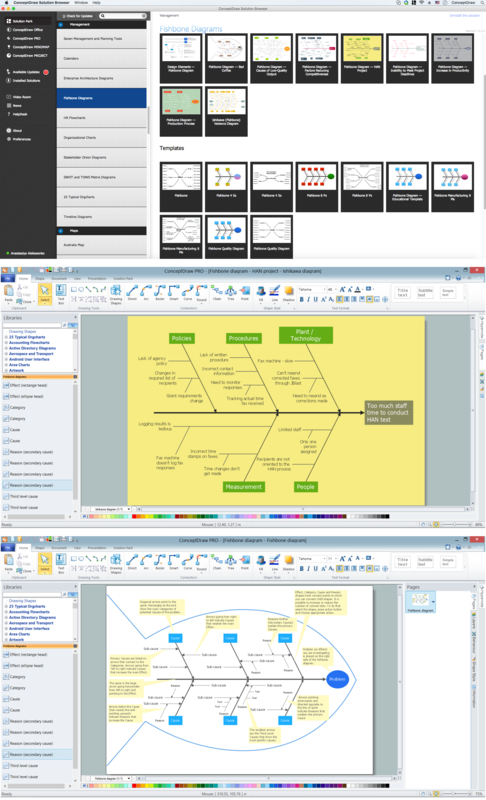 Another way of drawing the Fishbone Diagram (Ishikawa Diagram) in ConceptDraw DIAGRAM is to use as the base one of predesigned templates or samples offered in quantity at ConceptDraw STORE. Choose any desired that meets your requirements and simply change it according to your needs. The samples you see on this page were created in ConceptDraw DIAGRAM using the predesigned objects offered by Fishbone Diagrams library from the Fishbone Diagrams Solution. An experienced user spent 10 minutes creating each of these samples. 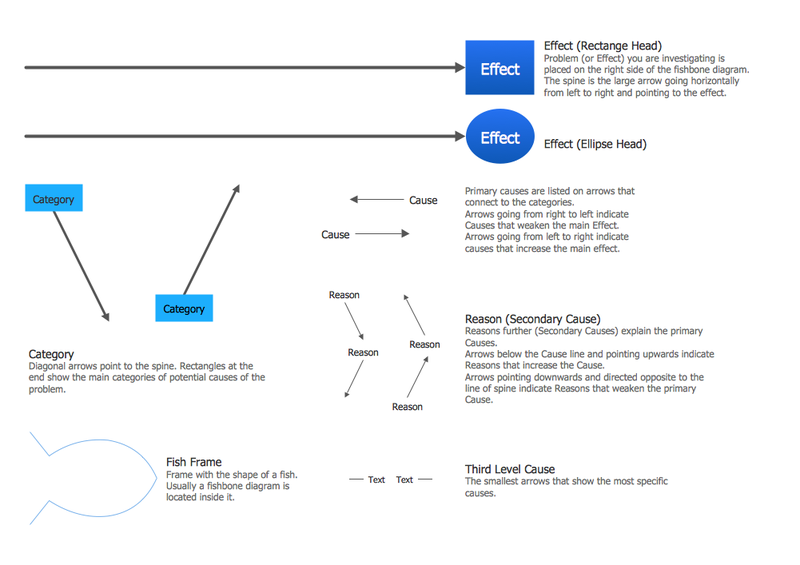 Use the Fishbone Diagrams Solution for ConceptDraw DIAGRAM Solution Park to create Fishbone Diagrams of any complexity fast and easy, and realize effectively cause and effect analysis. 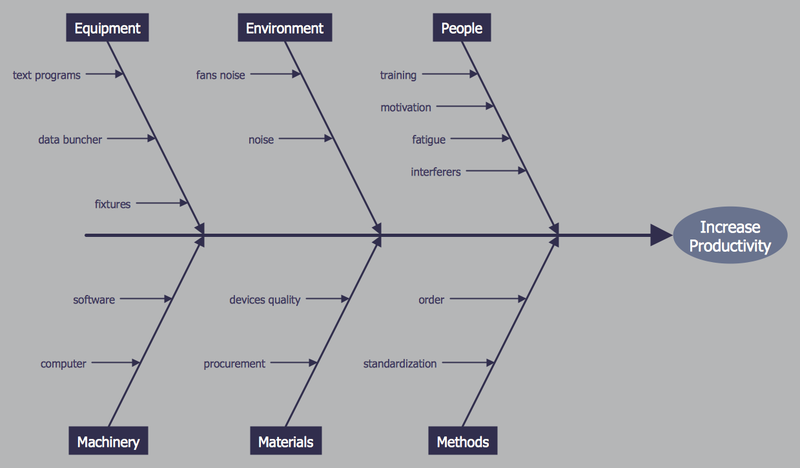 Cause and Effect diagram (Ishikawa diagram or Fishbone diagram) software helps you to show in one diagram the factors of Equipment, People, Process, Environment, Management and Materials, which all in general affect the overall problem and gives the base for the further analysis. ConceptDraw DIAGRAM v12 is perfect software for designers and software developers who need to create Fishbone diagrams. You will get a simple problem-analysis tool - Fishbone software tools for design element to easy construct specific diagrams and identify many possible causes for an effect to attack complex problem solving.